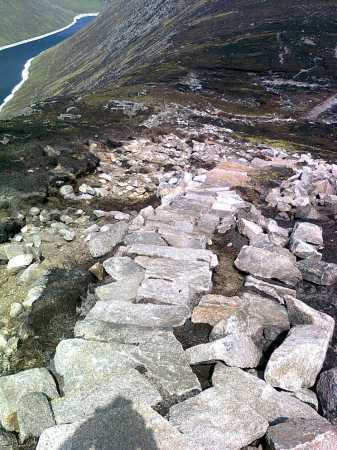 The construction work in the Mournes always stimulates a debate – not much of one albeit, but enough to interest us – at least those of us who walk the Mournes. My position remains clear and unashamedly against the work – any of it: when it was, what it does, the rationale and the ramifications. My view is that there are no redeeming features. None - and as it stands, indefensible. Note “as it stands”. One of the comments I have received goes like this – “Just leave he Mournes alone” and I should concur. That written, I do not expect everyone to agree – or in fact anyone – but as was once said “that is my story and I am stuck with it”. This makes neither me nor does it make anyone in love with the project…. an idiot … but does make for a difference of opinion. It is implicit in Simon 3’s recent enthusiastic marking of my homework that diggers are not always bad. If the above follows and in the context, diggers are always bad. Again, if the above follows, there is no laudable purpose. He craves subtlety. In the context of his diggers tearing up our beautiful mountain paths....?